step 1 Tear off a piece of 12” wide clear plastic wrap that is long enough to stretch all the way around your head and tie it in a knot under your chin. Spray a little water on your scalp first, so that the plastic wrap fits very tightly. After pressing the wrap tightly to your head, use strips of clear household tape (not wide packing/shipping tape) to contour the head shape. Beginning at your forehead, place strips of the transparent tape over the plastic wrap at the side edges of your bald area and work your way inward with more tape strips. step 2 Once you have a complete layer of tape running front-to-back, place another layer of tape over the first layer, going from side-to-side. Apply three layers of tape – two layers front-to-back and one side-to-side. The tape will lock the plastic wrap into a permanent, transparent mold (template) of your scalp. step 3 The location of your original, natural hairline can only be determined accurately by doing the following: Raise your eyebrows as though you are surprised. The skin on your forehead will wrinkle, but the skin on your scalp will stay smooth. The point where the wrinkles end and smooth skin begins is your natural hairline. Starting at your hairline, use a permanent marker to draw an outline of the area the base will cover. This will be the shape of your hairpiece base. 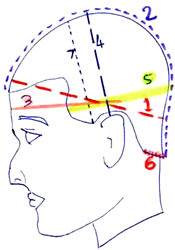 After the entire outer perimeter is drawn, draw arrows indicating the direction you intend to comb your hair. If you desire a part, draw a line from a point at the crown straight down to your hairline. Make sure to mark the letter “F” clearly at the front of the template and the letter “B” at the back. Write your name on the template as well. A good way to determine where your scalp begins is to raise your eyebrows and furrow your brow. The point where your forehead stops wrinkling is where your scalp begins. Your hairline should begin ½” – ¾” above this point. You can also use an existing hairpiece as a template. Simply ship the piece to me and I will have the base size and shape duplicated. The template piece will be returned to when the new hairpiece is shipped. Please note: When shipping an existing piece as a template, please shampoo the piece and remove all adhesives before shipping! There is an additional $40 charge for unwashed pieces. Please note: a template is NOT recommended for a full cap; instead, please refer to the diagram below for instructions on how to measure for a full cap. You will be asked for these 7 measurements in the store when ordering a full cap.